Turns out the Internet is pretty damn noisy. A new project from director and designer Timo Arnall puts the viewer at the center of service provider Telefonica’s data centers in Alcalá, Spain. 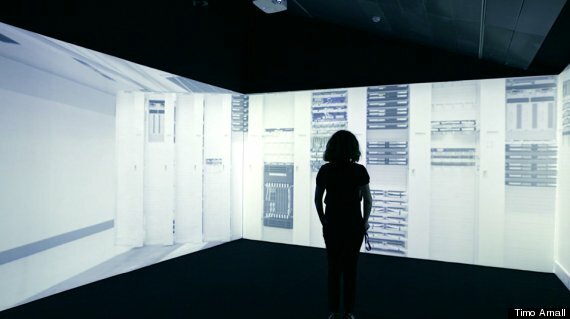 The project, called “Internet Machine," is a six-minute, three-screen film that lets people see and, more importantly, hear the sounds of Internet data being stored, per Gizmodo. Surrounded on three sides by the large screens, those viewing “Internet Machine” are immersed in the reality of the Internet’s physical moving parts. While the video's audio may sound soothing, the data centers are anything but. "Think of the sound from the fan on your computer. Multiply that by 20 times or more. Think what thousands of those all going at once would sound like," a commenter on a Quora thread once wrote of working in a data center, per Slate. The project is a part of the Big Bang Data tech exhibition, which opened May 9 and runs through October 26 at the Centre de Cultura Contemporània de Barcelona art center in Barcelona.